Leadership in education, higher rankings, increased research in areas of global impact, and a more diverse school are among the top quests for Ragu Balakrishnan, the new head of the School of Electrical and Computer Engineering. Up at 5 a.m., responding to e-mails from home, then bicycling — rain or shine — to the office by 8 a.m. set the pace for Balakrishnan’s invigorating day guiding the School of Electrical and Computer Engineering, a job he held as interim head for 15 months before being named head in May. “Coming to work is not work. It’s a pleasure,” he says. He oversees — all by consensus — a school of 81 faculty, 40 staff, 880 undergraduates and 660 graduate students. That mission has been fine-tuned into a new strategic plan with hefty goals that include leadership and excellence in education, field-defining research and a positive impact on society. While there will always be opportunities for faculty to conduct research individually or in small teams, Balakrishnan foresees more multidisciplinary efforts similar to three projects involving ECE faculty. These are the $105 million National Science Foundation (NSF) grant for earthquake studies at Purdue’s NEEScomm Center, the $18 million NSF grant for the Network for Computational Nanotechnology, and the $15 million Homeland Security grant for Visual Analytics for Command, Control and Interoperability Environments, dubbed VACCINE. Growing up in India, Balakrishnan says the overriding message was to be outstanding academically. “A huge premium is placed on academic success. I paid attention to it and did fairly well,” he says. So well, in fact, that when he earned his undergraduate degree in 1985 from the Indian Institute of Technology, he also received the prestigious President of India Gold Medal. Getting accepted to the institute was itself a feat; he competed against 100,000 students for the 2,000 entrance spots. Nicknamed “Ragu” by his mother, “a common name in India,” he says, he shares with her a love of people. His father, who died about a decade ago, was a chemistry graduate who managed a paper company. Balakrishnan has one sibling, a sister who lives in England and works in computer systems. In 1985, Ragu left India for graduate study at Stanford University. He arrived on a sunny California day. “It was 60 degrees, but it was the coldest I’d ever been in my life,” he recalls. He earned a master’s degree in statistics and doctorate in electrical engineering from Stanford in 1992, did postdoctoral work, then joined the Purdue faculty in 1994. 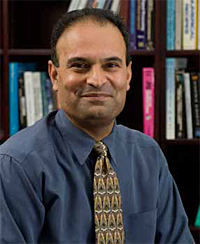 His research interests have included applying numerical techniques, especially those based on convex optimization, in engineering applications.